When a VM moves across vCenters, HA properties are preserved and DRS anti-affinity rules are honoured. The standard vMotion compatibility checks are executed. You will need 250 Mbps network bandwidth per vMotion operation. Another new function is being able to vMotion or clone powered of VMs across vCenters. This will use the VMware Network File Copy (NFC) protocol. You will not be able to vMotion from a VDS to a VSS. VDS port metadata will be transferred and cross vCenter vMotion is still transparent to the guest OS. You will still need Layer 2 VM network connectivity. In vSphere 5.5, vMotion requires Layer 2 connectivity for the vMotion network. 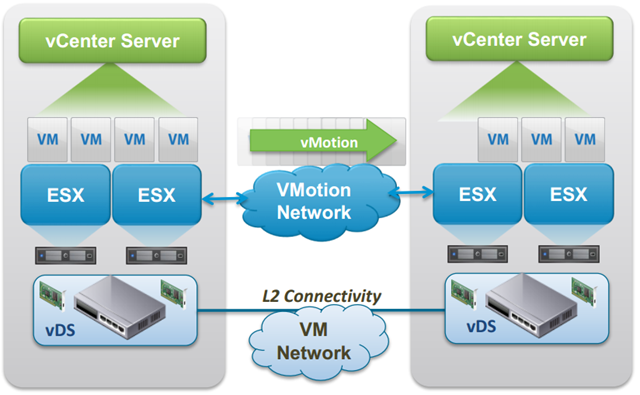 vSphere 6.0 will allow VMs to vMotion using routed vMotion networks. You can also use Long-distance vMotion to live move VMs onto vSphere-based public clouds, including VMware VCHS now called vCloud Air.. This may be long distance vMotion but it’s still vMotion, a Layer 2 connection is required for the VM network in both source and destination. The same VM IP address needs to be available at the destination. vCenters need to connect via Layer 3 and the vMotion network can now be a Layer 3 connection. The vMotion network can be secure either by being dedicated or encrypted (VM memory is copied across this network). vMotion not only involves moving over a VMs CPU and Memory but storage needs to be taken into consideration if you are moving VMs across sites and arrays. There are various storage replication architectures to allow this. Active-Active replication over a shared site as with a metro cluster appears as shared storage to a VM and so this works like classic vMotion. For geo-distance vMotion where storage Active-Active replication is not be possible, VVols will be required which creates a whole new use case for VVols. How and where are you getting this information? You must be one of those people who skips the keynotes 😉 It was in the day 2 keynote. This is exactly the writeup I was looking for. Thanks for putting this together. I’m curious on your thoughts of LVMotion between vCenters and the practical number of VM’s and associated data capacity that this would support. Seems that the listed use cases are only practical for a few VM’s depending on amount of data, size of WAN pipe, and distance.